Snoring earplugs can help you to get quality sleep, even if your partner is snoring loudly next to you. These earplugs work well for some people. Some products are more effective than others are. Improving quality of sleep is critical not only for the snorer, but also for the person sleeping with the snorer. After consulting with a doctor regarding the causes of snoring, it may become necessary to use earplugs that are placed into the ear according to the directions supplied by the manufacturer. This helps to reduce some of the sound from passing into the ear canal. It can help improve sleep drastically. When buying these earplugs, consider the following. Does the snoring earplug specifically state it is designed for snoring noise reduction? Is the product safe to wear all night long? Is the product safe to use in children? Is it reusable or one-time use? What are online reviews saying about the product? The answers to these questions can greatly help you to purchase the best product available. A variety of snoring earplug products are on the market. Some of these claim to block out snoring completely. Before purchasing them, you may wish to consider several products and read a few reviews. Beneficial Product's World's Finest Earplugs: Beneficial Product, a manufacturer, produces World's Finest Earplugs and claims they are the highest blocking NRR 34 ear plugs available. The product is made from beeswax, purified lanolin, and sterile cotton. Because of these materials, the earplugs are moldable to the shape of the ear, giving a comfortable fit. It also forms a tight seal, keeping all noise out, including snoring. SleepSoft: The snoring earplugs offered by SleepSoft are designed to be comfortable and offer an ideal fit. As they are worn, they become softer, to help them to fit the ear better. SleepSoft earplugs are single use products. If the product is wet or is exposed to heat for a period of time, this can cause damage to the earplugs, making them unusable. Snore Plugs: Snore Plugs are a hydrophilic foam product. This material is excellent at blocking out sound. These snoring earplugs are softer, making them more comfortable than other products. Unlike other products, they also help absorb any moisture in the ear canal, which keeps them comfortable throughout the night. These long lasting earplugs can be used every night. When misshapen, they will straighten into their standard shape within a few hours. Mack's Pillow Soft Silicone Earplugs: Mack's offers a variety of earplugs for swimming and hearing protection, but their Pillow Soft Silicone Earplugs are an ideal choice for snoring protection. The product is a moldable silicone earplug, so it offers an easy fit for most people. They are also waterproof. They reduce noise and are safe to wear all night long. Mack's also offers a child's version of these silicone earplugs. SilentEar Ear Plugs: TM Manufacturing offers SilentEar Ear Plugs, designed to a noise reduction level of 32. These snoring earplugs are reusable. They are made with a silicone rubber shell. Within the shell is a hypoallergenic silicone gel. The combination offers the intense noise reduction. This product is a good choice for those who have found other earplugs to be uncomfortable, since SilentEar Ear Plugs are available in several sizes. Boules Quies: Boules Quies ear plugs are a product of France. These are unique from others because they are a cotton wrapped piece of wax, which can be fitted to your ear, by you. To use them, a small amount of wax is rubbed between the fingers to soften it. It is then placed in the ear to seal out sound, giving a customized fit every time. These are some of the most common snoring earplugs on the market today, all of which can be purchased online. 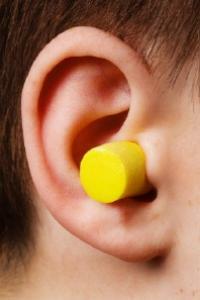 When selecting earplugs for snoring benefits, the greater the number of noise reduction offered, the better. Be sure to consider what is causing your partner to snore. Snoring can be a sign of obstructive sleep apnea or an underlying medical condition. In some cases, it can be treated.